Lionesses, female lions, give birth to cubs away from the pride. Typically a lioness will have between one to four cubs in one litter. Since cubs are born completely helpless, she keeps them hidden from all animals, including her own pride. Cubs don't even open their eyes until 3-11 days of age. When the cubs are about eight weeks old, she finally introduces them to her pride. 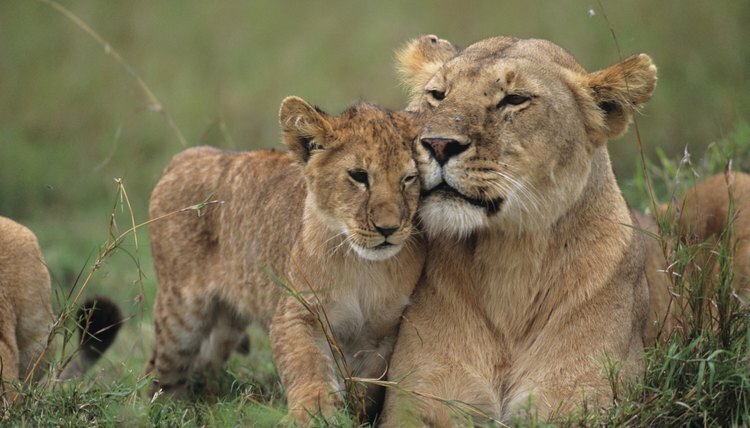 Many of the females in a pride give birth around the same time, so they have cubs of a similar age. This makes it natural for them to care for, protect and feed each other's young. In fact, the lionesses in a pride will often nurse other lioness's cubs. It is truly communal care. However, if another lioness has cubs that are more than 3 months older, the lioness with the younger cubs will not rejoin the pride. This is because of the communal nature of the nursing-- the older, stronger cubs will take more than their share of milk, causing the younger cubs to starve. This nursing will go on until about eight months of age. The skill of hunting is one every lion must possess. It means the difference between eating and starving. Contrary to popular opinion, lionesses are not the only hunters in the pride, so male cubs must also learn to hunt. Hunting training begins around three months of age. Although cubs still nurse this young, the lionesses take them to eat after the kill. One of the most important jobs of a lioness is to protect her cubs. The majority of cubs don't live to see their first birthday. Depending on the conditions, 40-80% die before turning one. There are two reasons for this: starvation and coalition invaders. A coalition is a group of ousted male lions from another pride. Their main goal is to find a pride of females. When they do find a pride, they must first fight the existing males. If they succeed, the coalition then goes after the cubs. It is thought that the lions kill the cubs so the females will mate sooner and their genes will be carried forth. The lionesses, however, do everything they can to protect their young. They will fight to the death, sometimes, and gang up on the intruding males. Although they cannot defeat the larger cats on their own, the group does sometimes succeed when working together. Lionesses will take care of their cubs until they reach the age of two or three. Then, the mother goes through estrus, her heat cycle, and carries another litter. The pride forces out the male lion cubs and some of the female lion cubs as well. They must now fend for themselves or find another pride.